It’s only a handful of times that I have felt this. It’s what I call a Mandela moment – being aware of living through something historical and extraordinary. Back then it was my 14-year-old self sitting at home in Johannesburg and just about comprehending that the white-haired man walking out of jail in Cape Town was going to change my life forever. Since then I have seen planes hit towers in New York and an African American elected to the White House and a woman chosen to lead an African country: for good or bad, these are my Mandela moments. Well, here’s another one. It’s the rapid death of a sacred economic cow that has got my attention. Here we go again – history in the making. It really seems like the tectonic plates of the world’s economy have shifted since September last year. Up until then we were all living with the effects of a 1980s revolution. Off the back of a century of Western economic exploitation, for almost two decades the spirits of Ronald Reagan and Margaret Thatcher bossed Africa around through the powerful IMF and World Bank. It was private enterprise or bust – with the abdication of state responsibility thrown in for good measure. The upside of this is that small and informal private enterprise has, to some extent, benefitted. The small internet café owner in Nairobi, Kenya for instance knows that he or she must sink or swim – as do the myriad of informal traders in the bustling markets of Abuja and Addis Ababa. There’s no unemployment insurance for them – and, apart from South Africa, no social welfare net to catch those who are unemployed. Without a state or large multinational bank to rely on – and with just their wits as start-up capital – perhaps these entrepreneurs will still survive the collapse of economic orthodoxy as we know it. All this week we have heard from the IMF conference in Tanzania that Africa will not escape the global recession, but maybe we should look beyond free-market capitalism to other threats for small businesses on the horizon. As it happens, BBC Focus on Africa magazine will be in shops in the next few days. The new issue looks at what is next for Africa – now that capitalism seems to be on its knees. You may be interested to know that the continent is in for yet more imperialism – this time from the East where, in China at least, a strange mix of Western-styled capitalism and authoritarianism exists. China and India, contrary to what some may think, will continue to probe the continent looking for hidden riches – laying our railway tracks and digging in our mines (or at least directing operations there). So Africa needn’t worry about whether or not to expect continued interest from the dragon and the tiger across the sea – what with the economic downturn and all. Oh no. The real question is actually whether or not Africa will be prepared for what is undoubtedly going to be continued interest. China will continue to grow as will India – albeit at a slower rate. And Africa will still be the fuel to that fire. Do African leaders have the strength (and the spines) – not to mention the integrity – to stand up to those who may bully for economic profit? And does our civil society have the strength to make sure that these governments behave? 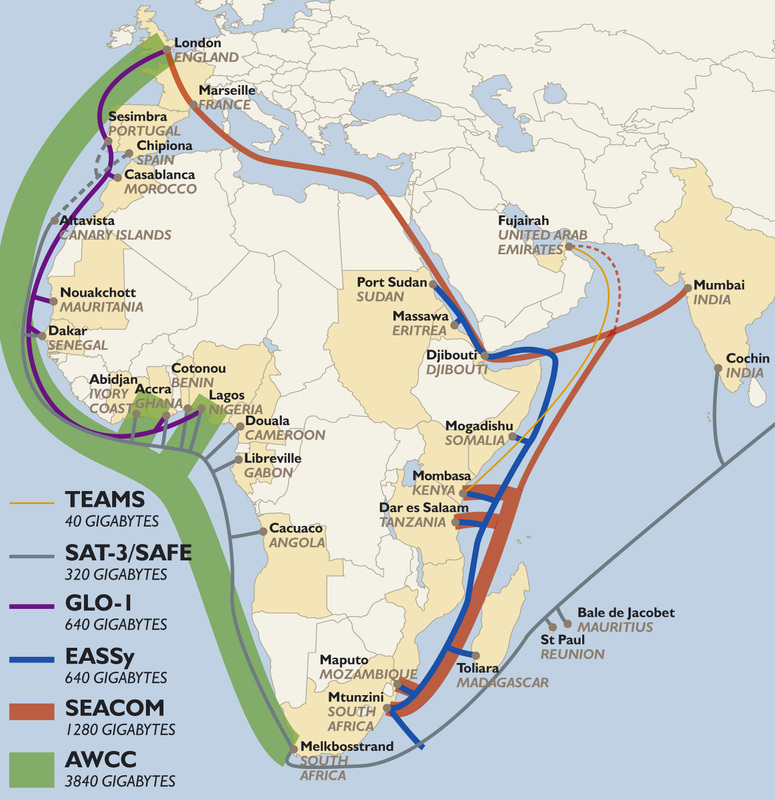 But telecommunication companies in West Africa involved in the SAT-3 cable have been accused of artificially driving up the cost of accessing the cable through monopolies. I guess this points to what should be the focus of any meeting or clashing of heads over this economic crisis – how to keep the small business owner afloat in his or her battle against poverty. Is the IMF saying this because they really believe it or is this just another way for the West to make sure it takes Africa down with it?